UniBlue SpeedUpMyPC 2010 is an utility to boost up the computer performance from Uniblue. 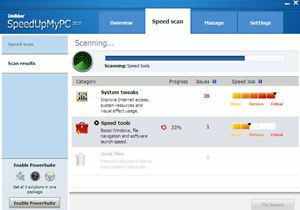 The UniBlue SpeedUpMyPC is being designed to identify system flaws which causing data bottlenecks and slowdowns, wields a multitude of targeted tweaks that boost system resource management, optimize system and network settings and get rid of the junk files that are bloating the hard drive. Scan your computer to pinpoint impediments slowing you down. Implement powerful speed up tweaks with a single click. Improve system resource management for better performance and stability. Tweak browser settings for a faster browsing experience. Remove junk files bloating your hard drive. Access a recovery center to undo changes at will. Unleash extra power with three powerful speed tools. 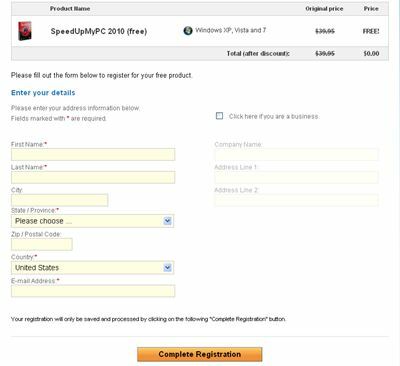 Visit promotion page, then enter the first name, last name, city, zip/postal code, country and email address and click on “Complete Registration” button at bottom. After that, SpeedUpMyPC 2010 serial key code will display on the screen.